I know, you can't always be a spectacular vegan, packing a fantastic vegan lunch to go. Some times even a vegan gets to feelin' poorly. Then, it's nice to stay home and comfort yourself with a nice big bowl of hot soup. Chicken noodle? Forget about it! Dead chicken can't hold a candle to a steamy, soothing bowl of Tomato Rasam. Resplendent with Indian spices, cilantro, and fresh ginger, this soup sings in your mouth, warming weary bones and soothing sore throats. Best of all, it takes a mere 10 minutes to make, but tastes like it's been simmering on the stove all day. Tomato rasam is one of our favorite sick day comfort foods. It's like soup for the soul. I'm not all that familiar with Indian cooking. What is the difference between curry and rasam? That picture is perfect, and the soup sounds delicious! I've noticed a lot of vegan recipies (especially Indian-inspired ones) call for cilantro, which for some reason I can not stand. I usually leave it out, but do you recommend anything in it's place? >>I usually leave it out, but do you recommend anything in it's place? You could add some fresh parsley for color, and maybe a shot of lemon juice or zest for a bit of that tangy, clean taste. But I think it would still be fantastic even if you just left the cilantro out. >>What is the difference between curry and rasam? Both curry powder and rasam powder are spice blends. You can purchase them or toast and grind your own spices. There are a lot of variations of both, and the flavors range from mild to spicy (we used a mild curry powder for our soup). 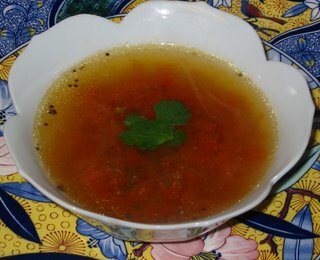 Rasam is a Sanskrit word that literally translates as "broth". It is usually a thin soup containing tamarind, but sometimes the tamarind is replaced with tomatoes, as it is in this recipe. Just to confuse matters, there is a curry plant (kari plant) with sweet aromatic leaves that are used in Indian cooking, but curry powders often don't contain any curry leaves at all! Curry powders are usually a mixture of turmeric, red pepper, coriander, cumin, and other spices. thanks for sharing. i love clear broths and Indian flavors. will definitely bookmark this for future use. This soup looks and sounds so yummy!! I'll have to try it sometime, since I love Indian food (though I usually don't use any chiles on the dishes I cook at home). What an absolutely gorgeous soup! Can't wait to try it! Rhis soup will surely cure what ails you. Hope everyone is feeling better. Wow - what a great idea for a sick soup - I love rasam! Hot soup with spicy spices is perfect soothing the sick. Here's my veggie version of hot 'n spicy soup un-chicken soup. What a divine looking soup for a nice, cold day!!! Thought you might like this recipe for Tomato Rasam from Indian food blogger Mahanandi. 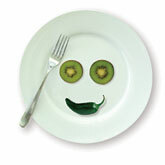 Slightly different to yours, and less oily so more healthy! Good recipe! My husband is from south India and rasam is a sick day food for him too. He has lots of memories of his mom bringing him hot rasam with rice to clear a stuffy nose or bring down a fever.